Many businesses feel as though the only way to obtain a competitive edge over their competition is through price. This conclusion, while seemingly obvious, in actuality couldn’t be further from the truth. It’s a fact of life that most businesses have competitors that offer a very similar product or service. After all, most new business owners learned their functional skill from a boss before eventually deciding to go into business themselves. As in many cases, this new business owner replicates what they know and have learned with their past employer, and therefore can easily fall into the trap of believing that price is the only defining selling point. Sure price can be a factor, but remember each business owner has unique qualities and therefore price is just one factor on which they can compete. So why do most businesses only have price to compete on? 1. They’ve failed to identify their unique selling proposition (USP). As a business, it’s crucial that you identify your USP – however, this is one element in business that is most frequently overlooked. A strong USP makes it far easier to market your business and essentially reduces the impact the price has on client acquisition. Clients won’t mind paying a little bit more if they believe they’re purchasing a unique product or service that actually offers more. So how do you differentiate yourself from your competitors? 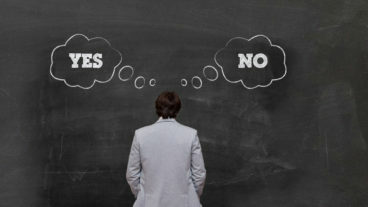 First, you need to determine what it is you offer that other businesses don’t – and why this is the case. A useful way to identify this is by working out which clients you achieve the best results for, and how they are different to your other clients. Then you need to craft a unified message that stands out from the crowd. Your message should focus on explaining the actual benefit of what your business has to offer, rather than merely stating your functional skill. For instance, I could call myself a sales and marketing strategist, which is my functional skill, however, I would then be trying to compete in a crowded market against all the other sales and marketing specialists. It also doesn’t truly encapsulate the benefits of what I do. I do so much more than sales and marketing strategy. I help organizations obtain Rapid Growth – a benefit many sales and marketing strategists do not – so I call myself “The Rapid Growth Guy.” You need to think deeper about what you provide; what makes you unique and different. Many businesses fail to separate themselves from the pack, and in the process they become a “me too” business. If you’re doing the same thing as everyone else and cannot identify your USP, then you only have price to compete on. This is not the path for you! 2. They haven’t identified their target market and their marketing strategy is evidence of this. It’s important that you identify which customer group you offer the most value to – and it’s this target market that you need to reach via your marketing efforts. Many businesses fail to achieve this. Instead, they attempt to “try to speak to everyone.” Due to the nonspecific nature of the message, these businesses end up “speaking to no one” instead. Rather than engaging in a blanket approach to marketing, you need to identify which target market will most appreciate your USP and where you can find them. · Determine which clients you get the best results for – what are their characteristics? · Identify the best ways to connect with those particular clients. · Tailor packages to suit your “ideal” customer – these packages should focus on your USP. One of my recent clients was working in the saturated market of auto-responders. As most saturated markets are, this market was highly educated and highly price sensitive. Within just a few hours of working with his USP, it was decided that his true value wasn’t offering auto-responders to a pre-educated market, but instead offering client re-engagement to niches where “auto-responders” was a foreign word. This resulted in a more informative sales process, as he had to now specify the benefits of his service. However, when it came to price, he could name it. This turned a product sold in a pre-established market for $1,200 into an $11,000 monthly recurring product overnight – and he subsequently acquired three new clients in just two weeks. Now I know what you’re thinking: is he ripping these people off? In truth NO, because without his additional education, which costs him more to provide, they would have never discovered auto-responder technology and failed to obtain what has now become a substantial return on investment. 3. They don’t know how to sell. Sales systemization is essential – however, many businesses simply don’t understand how to sell their products or services. Your business could have a fantastic offering, but if your sales process isn’t refined then it becomes harder than necessary to turn customer interest into actual sales. Many businesses wrongly believe that their products or services will sell themselves, and therefore fail to take the time to implement a proper sales process. · What to say when a customer calls. · How to generate greater interest from email enquiries. · How to discuss what your business does at networking events, thereby engaging listeners and evoking questions. · How to gain client interest in your USP. · How to turn interest into sales. Each one of the above processes should be systemized and eventually scripted. It’s important that your sales staff follows a tried and tested process that you know has the ability to deliver the best results. Oh, and if you don’t have sales staff, then as the owner of the business it is even more vital for you. The disconnection in your sales process can be anything from talking about price before introducing enough value, to choosing the wrong method of communication. 1. He was trying to communicate with people that were trying to outsource writing via email – the exact thing that they probably hated and were trying to avoid. 2. That the price on the website wasn’t a deterrent to people that didn’t have money, it was a deterrent to all enquirers. Truth is, he was expensive and if he couldn’t explain why before price was mentioned, no one would pay it. Turning his business around was easy. All we did was remove the price from his website, switched the focus of any return email to an enquirer from responding with answers/price to obtaining a phone conversation, and introduced a step-by-step sales call process. 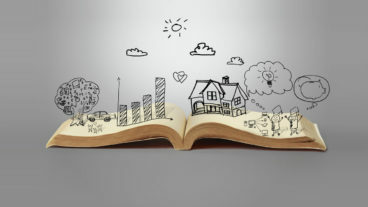 His very next sales call resulted in him landing a $40,000 project in just 40 minutes, and just seven weeks later he had closed deals totaling $80,000. Many businesses fail to implement sales systemization. Without it, price becomes the only factor they can compete on. 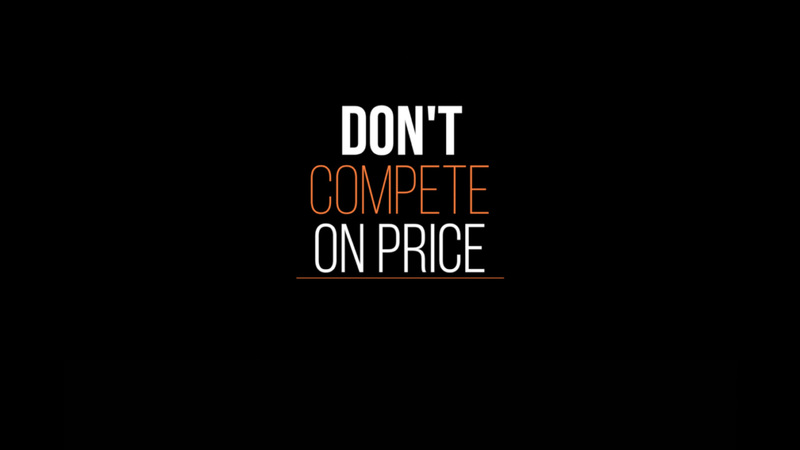 Price shouldn’t be the only thing you’re competing on! It shouldn’t be, but it is for many. While it does work for some select businesses, it simply isn’t sustainable for many. If you rely too much on price in order to remain competitive, it’s time to change the way you view your business, your marketing strategy and your sales process. As an expert business consultant, I can help. My “Get More Customers Program” will help you break away from being a “me too” business, while refining your marketing strategy and improving your sales process. Price is no longer the only factor you have to compete on! Leave me a comment below telling me how you’re going to change your business’ USP. How will you move your marketing from a broad approach to a specific niche? How will you implement a sales process into every part of your client interaction? Hi Matthew, do you know the Best Value Approach of Dean Kashiwagi from Arizona State University. It’s about procurement at value, not a lowest price! You’ve to find the right expert for achieving your goals or solving your problems. He has to prove he’s the right expert. Very interesting theory! Used it on catering services and company clothing with great results. Thank you Robert, I will check him out. Great ! Very interesting theory. Today you almost can find the same product at the same price among all competitors. Therefore if you want to be successful in your business i think that the better solution is to be different, build the loyalty and retain your customers. It is the fact that one entrusted customer will cost you less that acquiring the new one. Couldn’t have said it better myself, thank you for sharing. you’re absolutely correct my friend! I love this. The proof is in the pudding. BeatsByDre Headphones are not a superior headphone (how do you know? Audio engineer) but people pay 10+x the price to get the brand name. I believe costs them $40 or less to produce those SkullCandy’s #RealTalk. Bose, Sony’s etc. built for studio recording are WAY better! Additionally, Mercedes Benz, feeling of class, prestige is why folks buy. Honda – Lexus – Acura go 300k mile plus limited auto care while Benz breaks 100k an is having issues (how do you know? I had one) So you hit the nail on the head. It’s NEVER price. Adding to everything you’ve said here it’s “Perceived Value,” which contributes to your USP. Why you are different. (In my opinion, people focus TOO MUCH on the competition vs being authentic) the feeling that product/service provides (knowing how to sell because you’ve done the research), and the rapport the customer has with it (which will help craft the unified message). Well done my friend! Thank you very much for your feedback mate. Yes perceived value is certainly a major driver of higher prices. Matthew, you are truly a man after my own heart. I have been teaching my clients for years the importance of having a unique selling proposition for their businesses. I was met with very strangle looks. However, they now thank me for making them aware of this important key to business success. The principles work and the advice you have provided above is golden. Thank you Jamelle – I really appreciate your feedback and congratulation for being at the forefront of Marketing! Very interesting piece Matthew and I agree with your comments. Without outlining who you are going to sell to, why they would buy and how they can buy, a company will struggle to capitalise on their market potential. In a B2B world we are seeing increased polarization between transnational and consultative buyers with the former wanting to complete a sale in the simplest way (not necessarily the cheapest but to your point around sales systematization) and the latter needing guidance and support with understanding what it is they actually need to buy – again with price coming second to the perceived value they have been given. Holly, thank you for the great comment. You are 100% on the money. I’m a big fan of the consultative approach. These days, however, their is a lot you can do to educate the buyer before they pick up the phone. Thanks for sharing your knowledge Matthew. I will pass it on. We must first see value in ourselves, then communicate that value to others. It really isn’t about selling it is about adding value to people’s life. When they see it, know like and trust you, they buy into your solution for them. Teca, you couldn’t be more correct. Many people, however, really struggle to see their own value compared to their competitions. This is where 95% of the battle is fought. Price is indicative to what you are selling and who you are selling to.This is a very thorough article on marketing and sales follow through. It isn’t just generating sales. You must be authentic and honest up front.This improves sales dramatically.Word of mouth still goes a long way. Thanks Joanna. You never want to turn your back on word of mouth, however if you rely on it you’ll always be either in feast or famine – not a way to live. The goal of this article is to turn new prospects into willing and wanting buyers, so that they see you as a hugely valuable asset..not just a commodity. Value is SO much more important than price! I have service orientated business’ in my mind at this time of reading your article. I found it to be very concise and strategic in approach. Yet at all times bringing ones attention back to USP. USP – curiously what shows up for me as I read was the process of ‘Self-Actualization’ and social and emotional intelligence competencies that are relevant and necessary in order to create and build awareness thus creating the way and the space for developmental aspects to be incorporated and practiced in ones life. To know thyself is so important – to understand oneself enables for better understanding of others. It will bring you more and closer towards your truest authentic place. That which is your USP – with your authentic and creative hat on you will find and know with confidence. That which is your truth. Your message and offering to the world. Remember – Belief is power! Being courageous, sharing your truth. All of which you cannot achieve unless you become empowered and focus firstly on ‘self’. On your how and who are most important to you in your life. That which will bring you to your why. When you lay a strong but flexible foundation for yourself with the support of those that really matter to you in your life. It will be an easier way, less effortless approach to you finding your absolute and authentic truth. I could well even open you up to more of your unique dormant untapped authentic resources that lie within. Once you have done your fundamental and foundation ground work. Your insightful and practical approach. Will set you a sail and on course in the right direction for you. Feeling empowered in being empowered! Thank you for sharing your mind expansive thought provoking article. Wow – thanks so much for the great comment and sharing so much value with my audience. I appreciated the detail in this post. “Focus on value; don’t compete on price,” feels like old advice. It’s more useful to see how other businesses have made this transition in the past. Title doesn’t do it justice! Yes – the examples are key…otherwise its just theory. They what to do no way outweighs the how to do it. This was a great post, and one I feel I needed to see. I really enjoyed reading about the language school converting from “per hour” sales to per client deals! Amazing! Also, I picked up a nugget concerning pricing on websites. When a business settles with competing on price, in my eyes they’ve thrown all other possibilities of adding value out the window. Not to mention that when prices get lower, that money has to be recouped from somewhere, which usually leaves some employees out of a job. It also tarnishes the product/service. Everything is sacrificed…customer service, integrity, quality; cutting prices sometimes spells bad news, as in, I’m barely surviving. I talk about this when I present my coaching packages to potential buyers. I rarely negotiate on the prices, but when I do, there’s value obtained on both ends in the form of repeat business, contact lists, testimonials, and the like. I inform clients that this is an “enhancement process” and they can’t really put a price on that, but if they did, it would probably cost much more than what I was billing. I like to use the analogy where if it were a 3-credit college class that lasted 18 weeks, it would costs GOBS more. Lastly, people get out of what they put in. You spend a dollar, you treat it like a dollar, insignificant. But if you spend a few thousand, your mindset changes REAL quick! LOL! Once again, I really enjoyed reading this, and I look forward to reading more in the future! I also LOVE your idea around discounting in exchange for value. I suggest this to professional speakers all the time. When they are first starting out, they are always asked to discount and many times a testimonial or video of the event is of much more value than the money itself. Again, thanks so much for your great comment. Great article Matthew – couldn’t agree more. In business, we need to know our market and what they want, know our competition and know how we can provide and derive maximum value for both parties – business and client. Hi Matthew great article. I personally have always felt that when selling the value you bring in solving the customer’s problem is what you should focus on. However knowing what your goal is with the products you sale is also very important. The is nothing wrong with a low price if it is a lead magnet or an add on to deepen a relationship. To me there are two ways to make money: you can sell a whole bunch of stuff with lower margins, or you can niche down and sell higher priced goods and services. If you are not mass marketing, then it is important to look at your competition and the needs of your customers. Do more to solve the problem of your customers and you can command a higher price. If you can solve my problem then it is worth the money. If your not winning in your market. then you have to look at what you are doing first before any price adjustments. Get feedback from prior customers… did you solve their problems. What can be done to make the experience better. Probe and get feedback. Tip the scale toward overwhelming value and price starts to wither away. Sam, I tend to find helping the client is not the problem…it’s explaining, in simple terms, the value you provide to a new prospect, in words that they not only understand but get excited about. Sure, I totally agree less expensive items up front are a great idea.. That is if it is something easy to provide, that gives you a great up sell opportunity or that doesn’t cost you time (like downloadable products). For most people however, they are trying to sell a high value service…right now. For that this post is of paramount importance. Great article! A question that all salespeople should be asking themselves (or even brainstorming as a sales team) is WHAT IS PREVENTING MY BUYER IN THIS SITUATION FROM USING MY COMPETITION? This simple question has such a big impact on how salespeople approach their negotiations because it begins working the value muscle in your brain. The value muscle, unfortunately, doesn’t get much exercise for most sales people due to their constant fixation on transactional issues (price). I’ve trained thousands of Buyers how to negotiate and the first lesson I give them is to keep the negotiation with your seller focused on price. Buyers are being trained with very effective tactics to keep negotiations transactional because they know once value is introduced by a seller, their leverage diminishes. Value is price’s kryptonite! Great comment – thank you so much. I couldn’t have said this better myself. Readers, please heed Tony’s words here. Great blog post Matthew! I’m a firm believer in sales systemization and loved what you shared about the topic! Great summary, we are currently presenting our service as both cheap and fast, it seems that these two actually conflict with each other with our different customer avatars. We need to select the value prop that speaks to our best customer avatar and then stick with that! In short stop selling on features, price and discounts. People want to identify with your message, for that they will pay a premium. I like this article. Being authentic and providing exceptional services for clients and customers positions you ahead of the crowd. Great points. I have businesses that don’t compete on price at all. I hope it helps you. If your doing great already, imagine what you could achieve if you got your message on the money. Very interesting points. It is definitely important to have a clear USP but not always easy to identify it. A lesson I have heard a lot recently is never to undersell yourself as you devalue yourself and your service. It can be tempting to offer cheap prices to draw new business but a very low price can give the impression you are not as good or professional as others in the same field. Thanks for the comment – I totally agree. Sometimes giving a cheaper price feels like the right way to get a deal, but can actually lead to the client feeling that maybe your not as in demand/experienced as some of the other potential candidates. Re, finding it hard to discover your USP – I think this 5 step template will help you find your ideal message https://www.matthewpollard.com/growth. Thanks again for the great comment. Love the article, very insightful. I completely agree with everything – you need to show you’re unique to be able to stand out from the crowd. It was a pleasure reading it. The USP strategy article is well written Matt. Thank you. Offering one on one services with my clients provides a unique service that is starting to become rare in the repair and technology industry. Teaching my clients as we go provides them with a true solution to their problems, not one that ultimately leads them back to needing more assistance. I love the USP strategy. What I’m offering is something no other company is doing right now for my customer’s. Free services, and feeding kids at no extra cost to the consumer. Win Win for everyone. Thank you for this article. Michael, I am so glad you liked it. I love socially conscious marketing. If you can get rich while saving the world, well that’s just AWESOME! I think you hit the nail on the head. What I would also add is that companies and brands don’t know how to establish thought leadership. This requires becoming a media company or a one man PR team like Grant Cardone. You couldn’t be more right Austin, thank you for contributing. Have a great weekend. Matthew, I have to apologize I didn’t see this until today. I hope you have a great day too. Would love to read another one of your articles. What is your best one so far? Thank you! I look forward to reading more of your content.